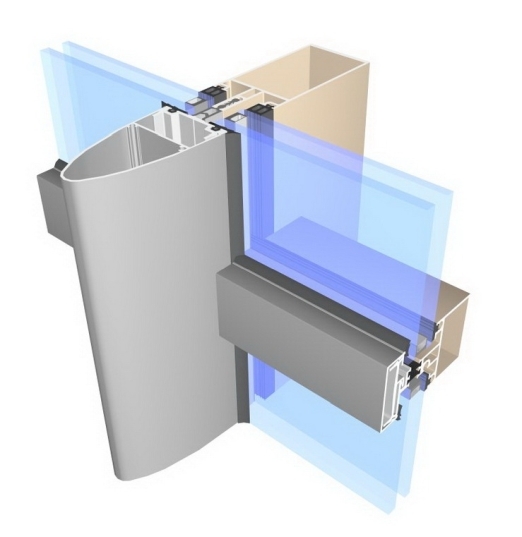 The MC-Wall curtain wall consists of vertical poles and horizontal transoms connected together by means of stainless steel bolts. 2 or 3 Ø 6 stainless steel connectors per one node provide a very high load-bearing capacity of the post-bolt, both in the plane of wind pressure and in the plane of the glass load. This does not interfere with the possibility of using traditional bolt brackets, or fixing them only with screws from the front. The bolts are insulated through a thermal break clamped at Aliplast at the stage of profile production. This eliminates possible errors resulting from the assembly of the thermal break on the construction site. The solution of the bolt integrated with the thermal break significantly accelerates the installation of the façade wall. 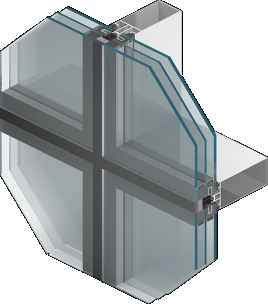 The selection of the spacer depends on the thickness of the filling in the curtain wall. It is possible to apply the thickness of fillings from 24 to 31 mm in the case of transoms with a folded thermal break, and up to 42 mm in the rafters with a separate thermal break. In the place where the wall is installed, a plastic insulation profile is shot into the poles. The construction of the pole is always traditional: that is, the thermal break, the terminal strip and masking are separate elements. The entire structure of the curtain wall can be finished from the outside with various types of decorative-masking strips with rounded edges ("soft line") and traditional strips, with a rectangular shape. The system is designed for constructing and making light curtain walls - flat type of suspended and filling type, as well as roofs, skylights and other constructions. The shape of columns and transoms allows you to build aesthetic facades with visible narrow dividing lines, while ensuring durability and strength of the structure. In addition, the profiles have rounded outer corners giving the so-called soft-line effect. A kind of aesthetic facade of the MB-SR50 façade is the so-called horizontal and vertical line, where the divisions - horizontal or vertical - are underlined. The use of a continuous thermal break made of insulating HPVC material and profiled glass gaskets made of EPDM allows to obtain an appropriate class of thermal insulation and minimizes the phenomenon of condensation on aluminum elements. Thanks to the layered structure of the lintel-under-window strip, in which non-combustible materials such as mineral wool and plasterboard panels were used, a fire classification was obtained depending on the construction F0.25 (EI15) NRO, F0,5 (EI45) NRO. For the creation of a broken wall in horizontal and vertical section, special overlay profiles and appropriately shaped pressure and masking strips are provided, which means that there are no limitations in shaping the spatial solid of the building, and eliminates the need for special angular poles. Semi-structural facade system. It is used to design facade structures which create a flat surface on the outside without any visible aluminium profiles. 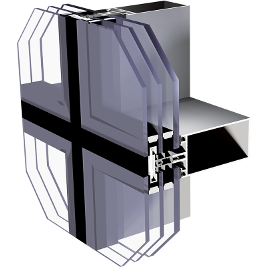 It includes curtain walls without any visible external aluminium elements. On the outside only glass infills separated by structural silicone gaps are visible. 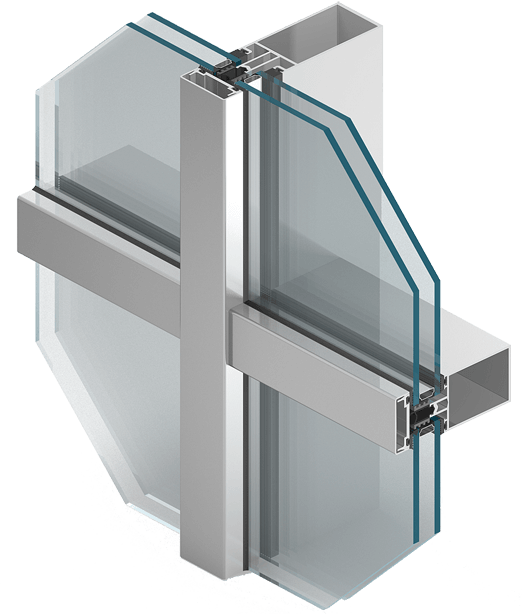 Glazing units have special profiled pockets and gutters in which mounting plates are installed to fasten infills to the curtain wall frame. A wide range of mullions and transoms suitable for static.